Testing an extended .357 SIG barrel with my handloaded ammo at the club range. LillyCaterina's Glock 19 equipped with ported barrels. My Glock 23 with ported barrels in both .40S&W/.357SIG. My Glock 35 with target sights. 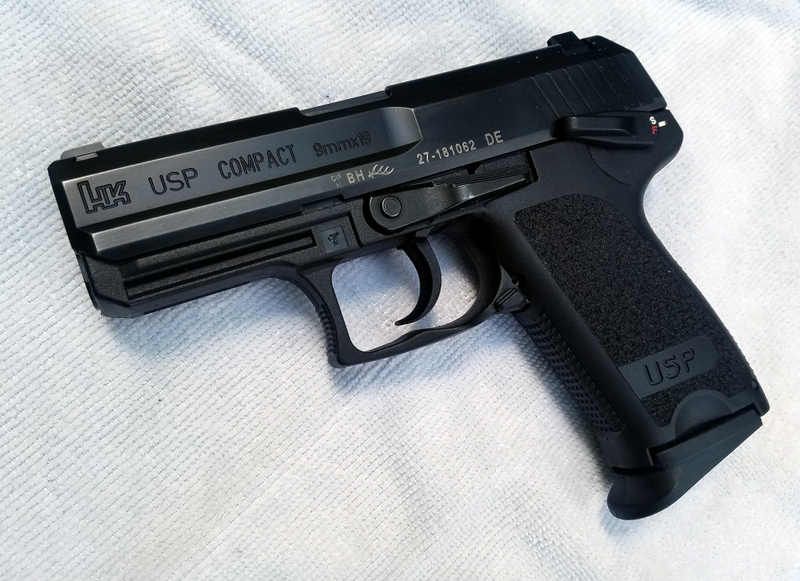 It's equipped with an extended barrel I have in both .40S&W/.357SIG. I also have a factory length aftermarket .357 SIG barrel. I'll post the rest of my guns down the road, but for now here are my two roller lock rifles. In front is my newest addition, a PTR built C93. Chambered in 5.56, it's basically an HK93 clone. I put all new furniture on it was well as had a number of mods done to it including the installation of a paddle release and picatinny top rail. Early results are promising, I think this is a very accurate rifle and I've only been using the iron sights. Still thinking about what optic to put on it. 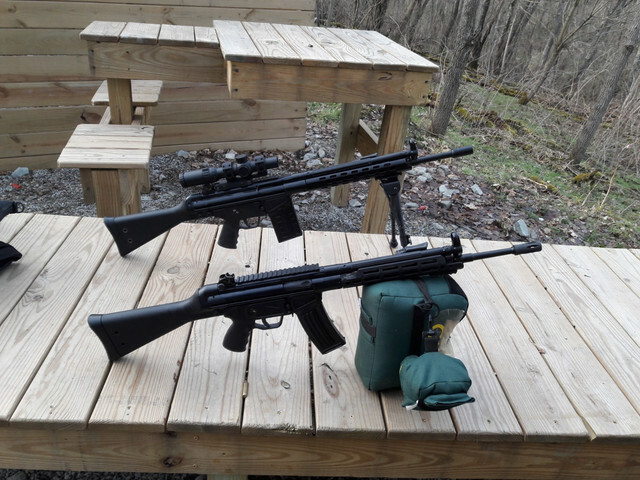 Rifle behind it is a PTR 91FR, pretty much the same rifle chambered in .308. 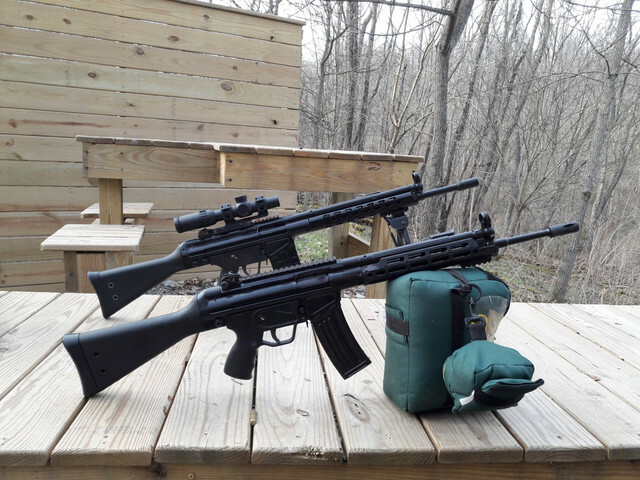 We had some warm weather this week, perfect for the first range trip of 2019. Also got a Howa 1500 Barreled Action in .308 at the same time, License also pending. 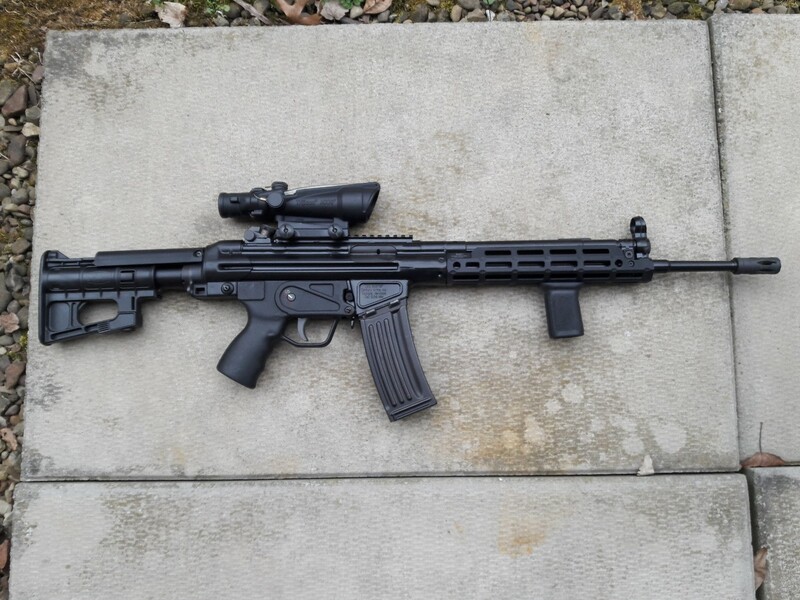 Looking at a Vortex Diamondback 6-24x50 FFP Tactical for glass with an MDT ESS Chassis. Both licenses approved a week ago, waiting for the license cards to be printed so I can, God wiling of course, fetch them from the gun shop, hopefully within two weeks. Having a 20MOA base fitted with the the Vortex Viper HS LR 6-24x50 FFP with XLR (MOA) Reticle. Have already purchased a reloading kit with .308 and 9mm P/L die sets. I did not purchase the MDT chassis, rather having the Houge over-mold stock epoxy bedded. A synthetic stock should be better suited to winter use than an aluminum chassis. Finally want to get the drop in mag well and 3 X 10 round box magazines with a sling and bi-pod. Thinking of doing a 200m Zero. Bought 100 pieces Lapua brass and 50 pieces Winchester brass for load development. Looking at the Hornady ELD-X 178gr for bullets , if I can get them to group that is. With a BC1 of .535 they should be an ideal contender for a long range bullet (If I can find stock as the gun-shops says their stock is getting delayed at Customs and everyone is out of stock at the moment...). I will also be upgrading the sights on the Glock 19. The Rifle has a 24" Barrel with a 1 in 10 twist rate, I see I can find enough ELD-X in 200gr with a BC1 of .597!! !, I wonder if this rifle will be capable of stabilizing these bullets. Impressive bullets to say the least. Since this photo was taken several others have been added. Herr Rentz, do you need different ammo for all those guns? Gareth is the resident reloader, but I've never seen .308 in a faster twist than 1 and 10. I could be wrong though, I don't have a background in precision shooting. Hornady makes great ammo for destroying anything made of meat. I think you'll like the Primary Arms scope as well. I have three of their scopes, it makes long range shooting a breeze. 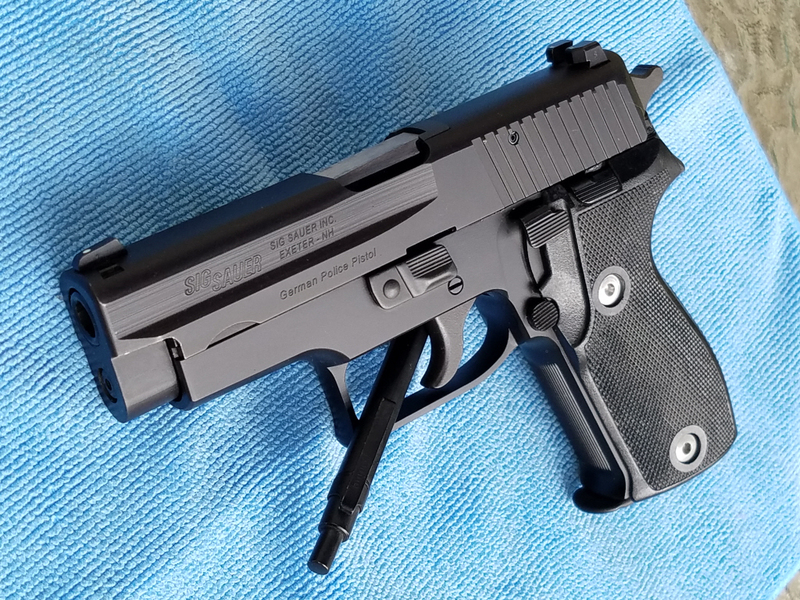 It's nice this thread was bumped, I just picked up a new handgun this week. For the first time that I can remember I won something in a raffle. In this case, I won a Steven 555 shotgun. They allowed me to take $600 in store credit instead. Unfortunately, it was at a very small gun shop with limited selection (to put it mildly). 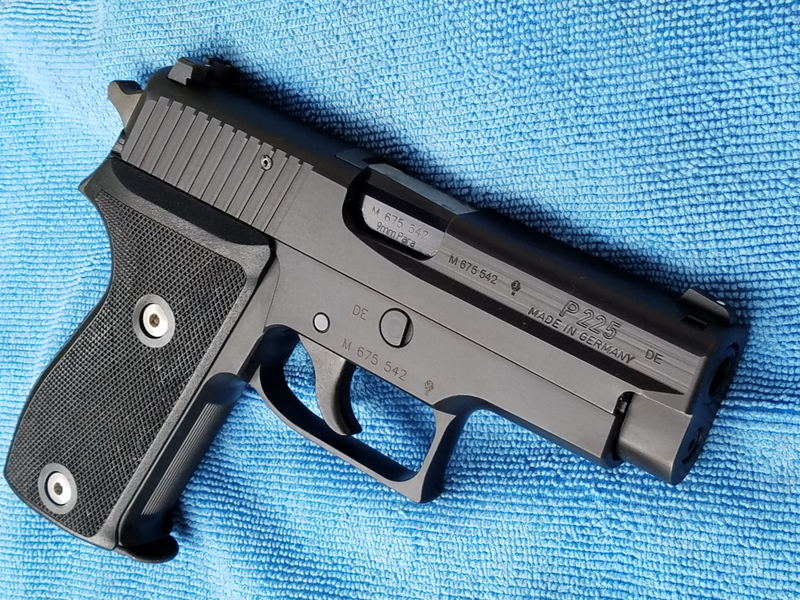 So I picked up another Canik pistol that's basically their version of Glock 19. It's a sharp little pistol. The Caniks have great triggers for polymer guns. Interesting coincidence, I passed on one Turkish made firearm to exchange for another. 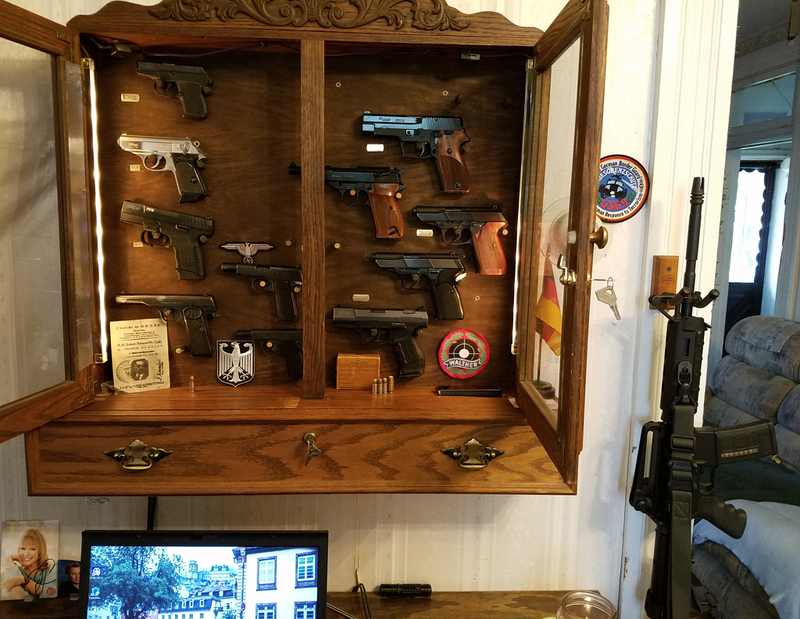 Left to right: M&P Shield, Bulgarian Makarov, M&P9, and on bottom are the two Caniks, the TP9SF is the full sized one and the newly aquired TP9SF Elite. The slide is Tungsten Cerekote. Nice fiver optic sights as well. 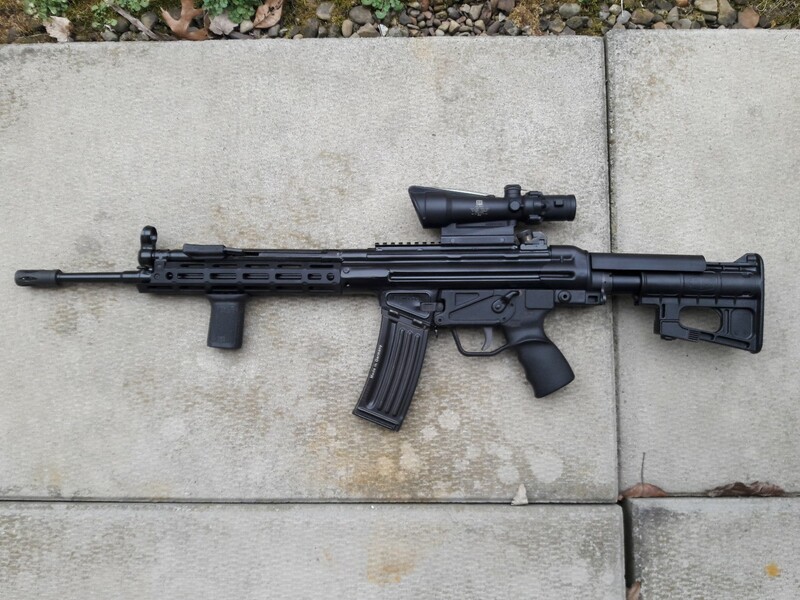 And I made some changes to my PTR C93. Added the Spuhr stock and Trijicon ACOG TA11J-G. The ACOG with the Spuhr stock are an absolutely amazing combination. Unfortunately, this is one of those gun projects that spiraled completely out of control with regard to cost. Needless to say, I won't be making new purchases for some time. 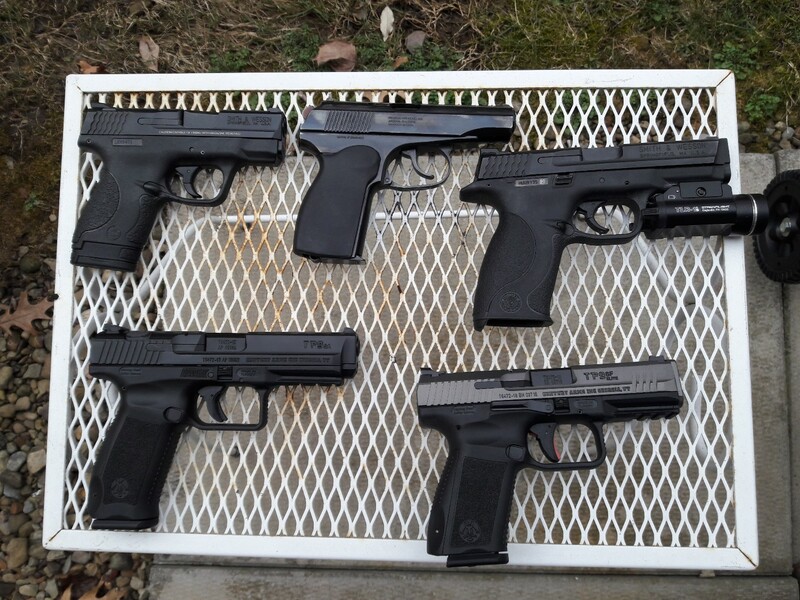 I'll post the rest of my guns when the weather breaks and I can spend more time at the range. Bittereinder: "The Rifle has a 24" Barrel with a 1 in 10 twist rate, I see I can find enough ELD-X in 200gr with a BC1 of .597!! !, I wonder if this rifle will be capable of stabilizing these bullets." I realize the bullet you've selected would not provide the same performance as the Sierra bullets represented on this page from their .308 load data, but it does provide reliable reloading information, including various powders that can be used. I prefer Varget for 30-30, and RE-15 for .243 Winchester. Test barrel: 26" with 1x10 RT. Yes. 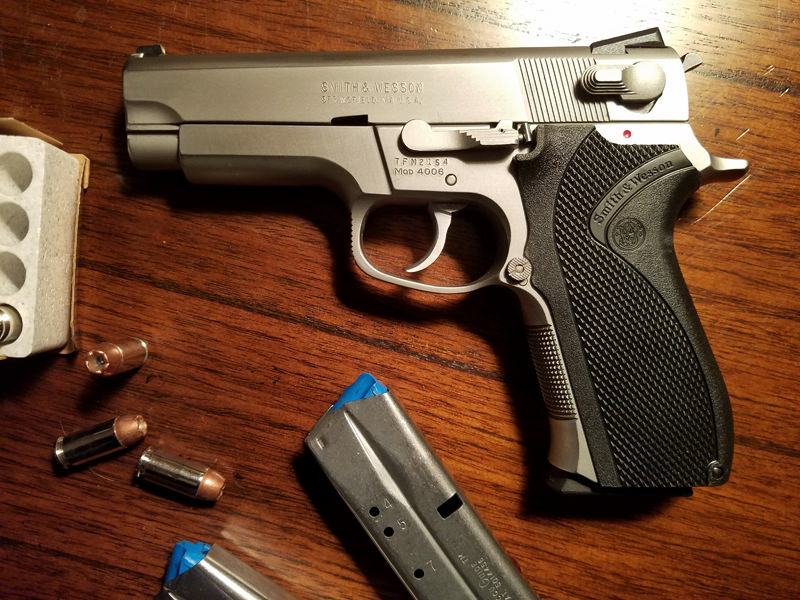 Calibers are 6,35mm, 7,65mm, 9mmK, 9mm, .40S&W, and .45ACP. Finally received the licenses yesterday! Have just about everything else one could need. Upgraded to tritium high-viz sights on the Glock with XTP 124gr Somchem S121 propellant (Rheinmetall Denel Munition tin) to reload for self-defense, a weapon light and a plus 2 mag is all I need now to complete it. Will hopefully be breaking-in the .308 next weekend, opted for ELD-X 178gr with Norma 202 powder with Lapua brass and 150gr Remington's for the break-in procedure. Got the Lee Breach-lock kit with a few other bits and bobs. Will post back if I can get it to group.